I have bought her book, entitled Hope in the dark, but I have yet to read it. 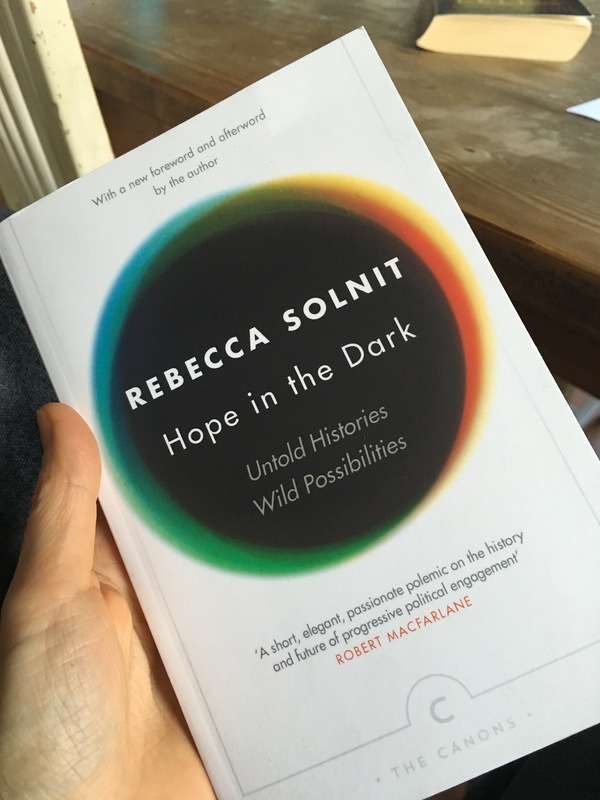 I have however, over and over again, listened to Rebecca Solnit and Krista Tippett in conversation at On Being of how people are falling together when disaster strikes. Thing is – why does it have to be only when there is chaos, havoc and peril at hand, for people to fall together and be there for one another? And does it? I venture a No. It doesn’t. But, as Rebecca describes in the podcast, the story we are telling ourselves is that we are bad a taking care of each other, that we are prone to revert to more primitive behavior; that at our core, human beings are programmed to look out for one thing, and one thing only: the self, not caring about others. And we don’t have to. We can tell ourselves another story. We can point to the fact that when crisis hits, people automatically know what to do, how to behave, and altruistically help and aid each other in the community. So – what if we told ourselves stories that point to this – our innate ability to be there for one another, of togetherness and community – rather than the egotistical and selfish behavior that drive us farther apart? And what with the political state of the world right now – with Brexit, Trump and more refugees on the run than ever in human history – wouldn’t a story of human support and community-building help provide a sense of hope that we need more than ever? In 2015 I ran a series on herothecoach.com with Sunday postings of podcasts to my liking. In 2017 I will be re-posting some of those blog posts, mixing them up with new podcast recommendations, such as this one.